Wax mixes differently than watercolors. The kids at Child Central Station had fun blow-drying crayons. Practice mixing by “Squishing Colors” colors with Picklebum. Preschool Projects has a great idea to send secret messages to your kids through their painting projects. 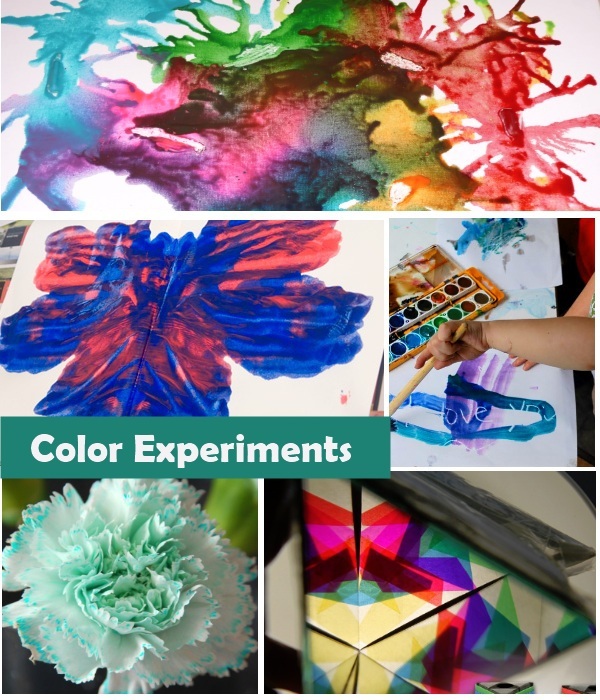 Science Sparks changes the colors of flowers in a recent science experiment. Make your own Kaleidoscope with the JellyFish Jelly blog. Do you have a kids activity that you’d like to share with the world? We’d love to hear about it! Link up (and if you love us, link back). Note: All posts must be family-friendly, kid-related and we just might feature you 🙂 By linking up, know you are giving us permission to do so. Hello and thank you for featuring my kaleidoscope. I have added you to my link parties page and will return! blow drying crayons.. now that’s cool! Off to take a look! Thanks for including me in your round up!